Make sure you find out if there are problems with your newly built home before your 12-month builder’s home warranty expires. Let an inspection from A-Pro – performed 10 to 11 months after the house was built – help you prevent costly repairs that will be your responsibility once the warranty expires. But it’s practically a new home? What could be wrong with it after only one year? A great deal, in fact. Many systems and components of the new home warranty will expire after 12 months. Get the peace of mind of having an A-Pro certified inspector perform a detailed check of your home, including a thorough examination to uncover any critical foundation settling issues. A-Pro detects notable defects before your one-year builder’s home warranty expires. We meticulously document and report visual defects that may be covered under your builder’s home warranty in order to maximize your home warranty coverage. Our home warranty inspection report provides leverage that will help you obtain necessary repairs prior to warranty expiration. The comprehensive report is delivered to you in a hardbound volume. Our inspection provides a last-chance opportunity to economically correct installation deficiencies common with new home systems and components failures. 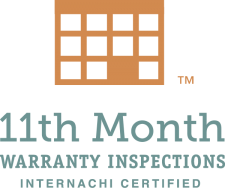 We highly recommend scheduling your home warranty inspection at the beginning of the 10th month. This will give you time to discuss our report with your new home warranty provider. Waiting until the last minute can force new homeowners into a disadvantaged negotiating position. Regrettably, some home warranty providers charge high premiums for their warranties but are less enthusiastic about paying claims. Call A-Pro Home Inspection today at 1-440-961-2099 before your new home warranty expires, leaving you with safety and performance-related deficiencies that should have been corrected. Tagged BUILDERS HOME WARRANTY EXPIRATION INSPECTIONS, home warranty evaluation inspection, home warranty inspection, new home warranty expiration inspection.